Posted on March 3, 2010, 7:13 am, by jfriedman, under Gallery Ihn, JeongMee Yoon. 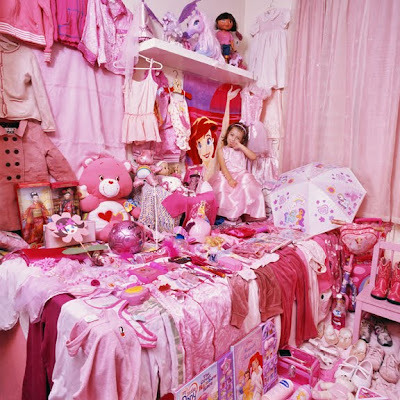 IHN Gallery in Seoul is showing the second installment of JeongMee Yoon’s photographic series “The Pink and Blue Project.” The idea behind the series was simple enough—to examine what conditions children’s blue and pink preferences: is it nature, nurture, marketing?—but Yoon’s execution is both meticulous and imaginative. 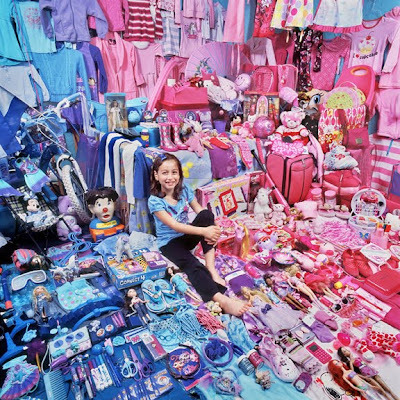 The first set of photographs, in most cases taken in 2006, shows their subjects (little girls and boys) encircled by their color-coded possessions—pink and blue, respectively. Shot with the wide-angle lens, the images initially overwhelm by the mass of monochrome objects big and small. In the pink prints in particular, the girls seem to blend into the field of pink dolls, dresses and books. Fast forward another three years, to 2009, and the same children pose in updated interiors. The boys, of course, are still proudly showing off their cars and sports parphanelia. The girls, many having “graduated” out of pink and into blue, are now independent from their background. No longer cute live ornaments swathed in pink and matching their arranged surroundings, the girls appear to take charge over the multitude of objects around them. It could be just the function of color (colder blue does not subsume their pinkish skin), or it could be my own reading based on the ubiquitous assumption that pink=marketing of girlhood=compromised personality. In either case, Maia and Her Pink Things, (2006) compared to Maia and Her Pink & Blue Things, (2009) is a case in point. In the early print the girl is subsumed into the pink arrangement, in fact the pink bear and the Disney princess are more visible than Maia herself. In the later version, where she is posed on the dividing line that splits the room diagonally into pink and blue parts, the pink portion is in the background, appropriately, providing an interior version of atmospheric perspective. That is the limit of its function in the image. Meanwhile, the blue segment (of which Maia is now a part—she is wearing a blue top), lets the viewer know unequivocally the relative place of the person and her possessions—Maia is the focus here. You can see more of Yoon’s work on her webpage.